© José Hevia . Pubblicata il 17 Maggio 2012. The old marketplace of Alcañiz has not been home to a market for some years, but now it has once again become a part of the town square, an area for socialising, passing time, and education. 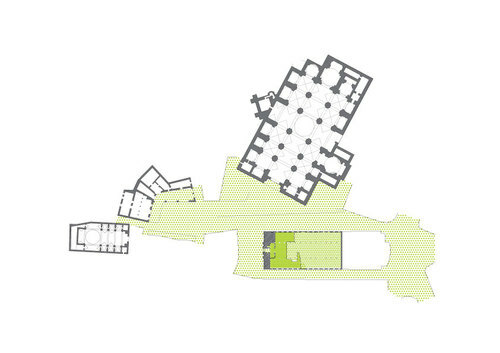 The enormous space inside the building has been reconnected to its environment via the introduction of a newly built element. Independent of the existing structure, it is an exercise of occupation strategic, respectful and reversible. Its two levels are enclosed within a homogenous and continuous skin. The piece acts as the entrance and exit of the main hall, leading to spaces on different levels, facilitating movement between them, and creating secluded spaces in the lateral naves for new educational programmes. The design was guided by the premise of maintaining the old marketplace as a public space; an addition that sought to keep its original spatial qualities intact instead of diminishing them. © miquel mariné, césar rueda boné . Pubblicata il 17 Maggio 2012. © miquel mariné, césar rueda boné. Pubblicata il 17 Maggio 2012.